We were making the matching bracelet to the necklace that was yesterday’s post but then we realize that it would be perfect as pair of earrings instead. 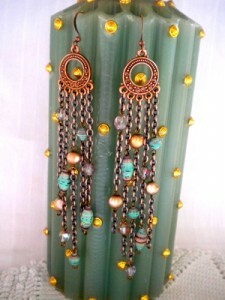 The turquoise colored olive paper beads complements the bronze pearls really well. We used the same five loop earring finding for the necklace. You can make the bracelet the same way, just continue ’til you have reached 7 or 7 1/2 inches and attach the other finding on the other end. 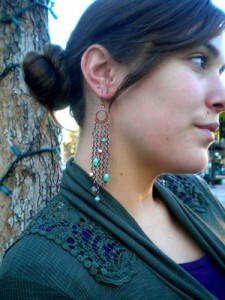 I love these earrings that match the necklace! Great job! 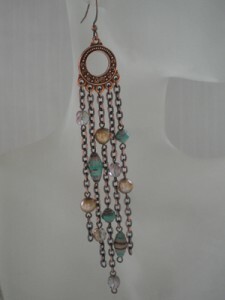 This earrings are so lovely !